L'Hiver long, parmi les plus secs de ces dernières années, avait marqué le début de ce millésime 2013. Puis un printemps quasi inexistant, un développement végétatif de la vigne au ralenti, de fortes variations climatiques... Le travail du vigneron a donc été crucial pour obtenir, en volume faible, des raisins de bonne qualité. 2013 est un millésime compliqué, tardif, mais très bien équilibré et prometteur. Still lively, with a mix of blood orange, plum and bitter cherry fruit flavors that stretch out over an iron note. The finish has tangy cut and lingers nicely, and there's enough stuffing to let this stretch out a little bit more in the cellar. 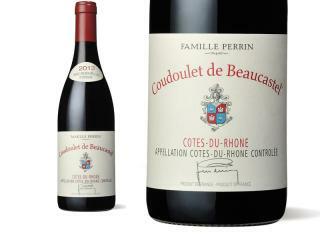 Unlike many vintages of Coudoulet, this one is medium-bodied and fruit-forward, offering hints of cherries, mulberries and wild Provençal herbs. Those garrique notes linger on the softly dusty finish. Drink now–2023. Rich aromas of sun-warmed earth and stones lifted by black cherry fruit. Firm, structured palate packed with sweet, juicy strawberries and cassis and sprinkled with pepper. Fine, grainy tannins and good length. Rustic but real. Drink 2016-2018. Lush and spicy with rounded fruit and juicy flavors; ripe raspberry, cassis and spice; complex and rich with depth and lovely structure. 30% Grenache, 30% Mourvèdre, 20% Syrah, 20% Cinsault. The 2013 Coudoulet de Beaucastel Côtes du Rhône offers a surprisingly ripe, rounded style to go with notes of wild strawberries, jammy black raspberry and peppery herbs. It’s drinking beautifully today, but it has good mid-palate density and I suspect will evolve nicely on its balance.